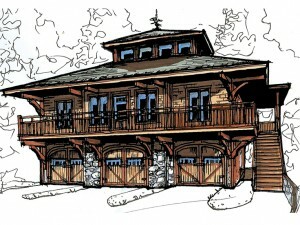 Carriage house plans are available in a wide range of architectural styles and sizes. They are designed to accommodate a variety of needs and many are flexible enough to accommodate multiple needs. We offer an extensive collection of carriage house plans, but with so many to choose from, some of the best designs are easily overlooked. Below are nine flexible carriage house plans that can satisfy multiple needs, offer functionality, and a comfortable living space. These charming carriage houses are often overlooked, so take some time to learn about them and find out what you might have otherwise missed. 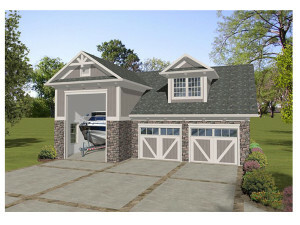 019G-0011 This charming carriage house plan offers a Craftsman exterior and extra deep garage bays to accommodate boat storage. With its one bedroom, one bath apartment above, it makes a nice weekend house at the lake giving you a place to eat and sleep when you want to go fishing for a few days. Additionally, it provides a place to store your boat until you return to the lake the following weekend eliminating the hassle of towing your boat to and from the lake every time you want to go fishing. Or, if you prefer, build this carriage house in your backyard where you’ll have extra parking for the growing family fleet and a private living space for your college student who isn’t quite ready to leave home. 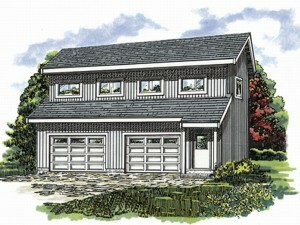 006G-0160 Take a look at this carriage house plan with RV storage. It is specifically designed for those who spend more time on the road than at home. It offers the opportunity to sell your home and build something smaller that you can call “home base.” While you’re traveling, you’ll rest easy knowing you don’t have a huge house waiting for you at home with lots of maintenance to attend to when you return. Instead, you’ll have a cozy place to stay when you become a weary traveler. It offers an extra deep garage bay that nicely accommodates your RV and your car. 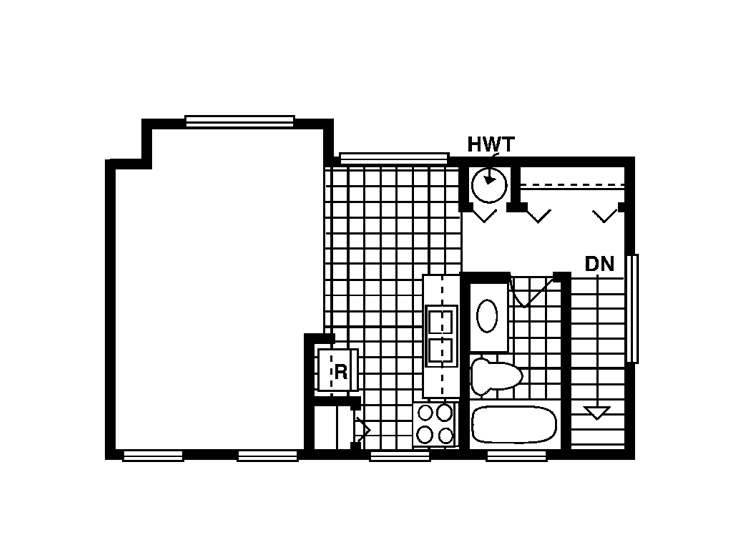 The living quarters provide all of the necessities in 681 square feet of living space. However, if you’re looking for a single level garage apartment for an aging relative and you’d just like a little extra parking for yourself, this carriage house plan is the solution. 023G-0003 Dress up your backyard and add value to your home with this stunning carriage house plan. You’ll appreciate the 2-car garage which offers extra parking for your teenager’s car and your motor cycle or ATV. The family handyman will appreciate the workshop area where tools can be organized and stored. Additionally, the workshop space offers a place to work on DIY projects. Weekend guests will find all of the comforts of home in the second floor apartment. The living quarters offer one bedroom and a full bath plus an open floor plan with kitchenette and generous living space. But don’t be fooled! This carriage house design can be used in other ways too. The workshop can be finished as a game area for the kids instead of workspace for Dad, and the second floor apartment could be finished as a home office for the work-at-home-parent who needs a little privacy without leaving home. 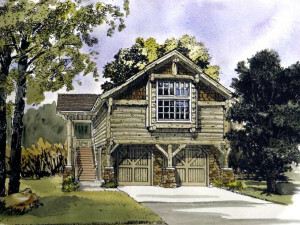 066G-0009 Rustic in design, this carriage house plan looks like it was meant to be a hunting cabin in the woods. The two-car garage offers ample parking while the second floor living quarters offer comfortable accommodations for those who prefer to “rough it” in something more than a tent or camper. The apartment features a full kitchen with eating bar, spacious living area, generous bedroom and a full bath. This carriage house plan also makes a nice alternative to a vacation home or it could easily serve as rental property or lodging at a wooded and rustic resort. 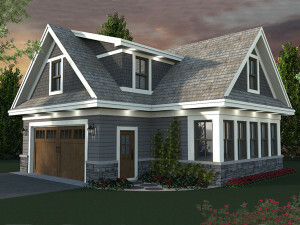 072G-0030 Compliment your home with this charming carriage house plan. For those who just need a little extra parking space, but wish to earn extra income, this floor plan is worth a closer look. The simple design blends nicely with a variety of architectural home styles, and its rectangular footprint fits neatly into many backyards. The two-car garage offers ample parking or storage space for the family cars, a golf cart, or even a pair of kayaks. A private entry opens to the stairs leading to the apartment above the garage making it the ideal rental property for a college student or a single starting out on their own. The private entrance ensures your valuables in the garage are safe, and your tenant has privacy as well. With the extra income from your tenant’s rent payments, you’ll be able to pay off your new garage sooner than you might expect. Then, one day, when you no longer have a tenant, you can use the apartment as your guest house. But maybe you don’t plan to rent the living space at all. Maybe you need living quarters for your nanny instead. The apartment gives your nanny a place to call their own when not on duty, while still keeping them nearby in case of emergencies. 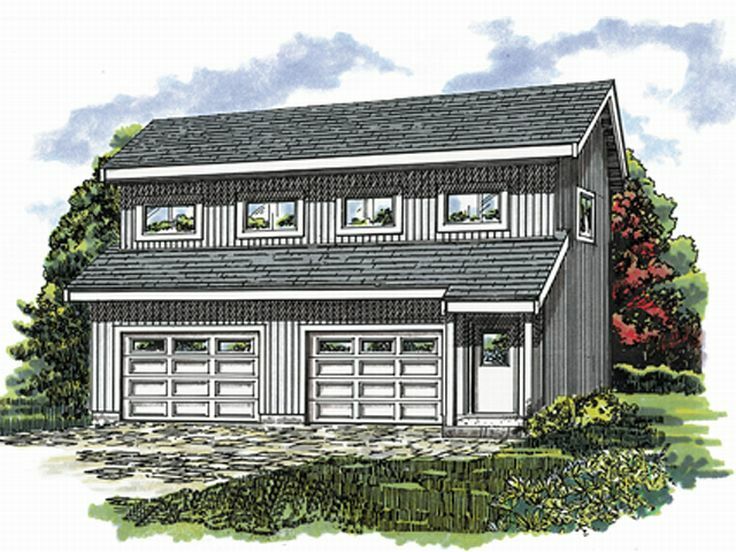 025G-0002 This unique carriage house plan has more to offer than you might expect! With its covered porch, full kitchen and full bath, it can easily serve as a pool house for those who enjoy entertaining beside the pool. But look more closely and you’ll see this is more than a pool house. It is just right for a mother-in-law cottage as well. The single story design is well-suited for an aging relative that might be challenged by stairs. A full bedroom delivers a place to rest while the activity room can easily be finished as a living room. This gives your loved one a safe and private living space while keeping them close by in case they need a little assistance. 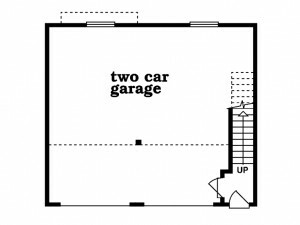 A 2-car garage completes the design. 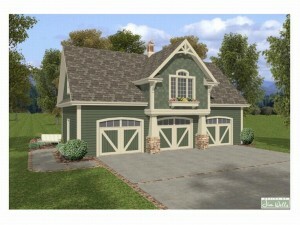 063G-0002 Country styling gives this carriage house plan with 3-car garage plenty of curb appeal. For those with a growing family fleet, there is plenty of parking in the 1400 square foot garage. On the second floor, a one bedroom, one bath apartment with laundry closet works well as a guest suite or for a hired hand on your ranch or farm. However, with a little imagination, this carriage house design could easily be converted for use by a home-based business. The garage could serve as a storage area or workshop for the business and the second floor could be finished as an office area and meeting room to meet with clients. 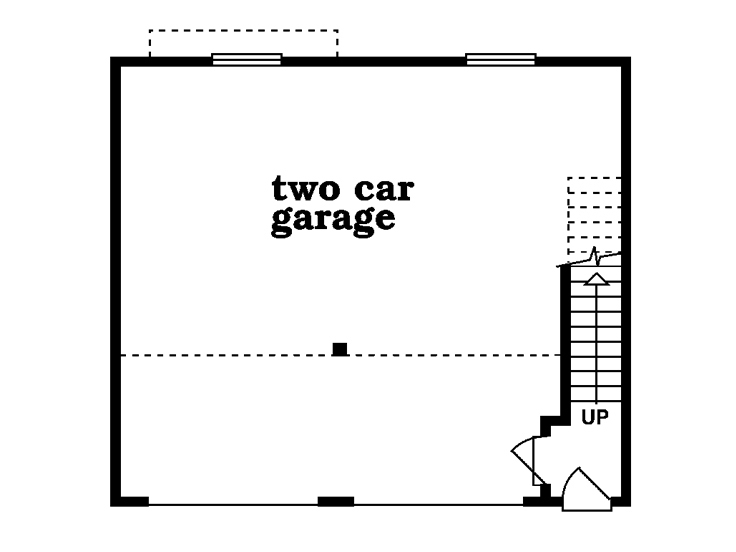 007G-0013 Here’s a practical carriage house plan with RV bay or boat storage and a two-car garage. A 16’ ceiling and an extra tall garage door easily accommodate your RV, motor home, camper or boat in the garage bay on the left, while the double bay on the right offers parking for your everyday vehicles. An office in the rear provides a quite place to work and the efficiency studio apartment above is just right for a guest suite. However, if you are looking to downsize your home for something smaller so you can travel the country in your RV, this plan is the perfect place to call home. It can serve as your home base when you’re not on the road and offers all the basic necessities when you return. 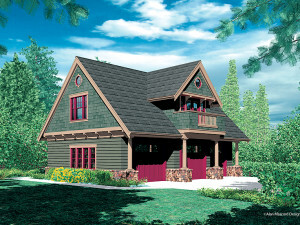 034G-0010 This Craftsman-style carriage house plan has eye-catching curb appeal. 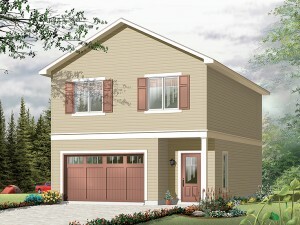 The main level offers a 3-car garage with plenty or parking or storage space. Or if you prefer, finish one bay of the garage as a workshop instead. On the second floor, a two-bedroom apartment offers plenty of room for weekend guests to kick back and relax. However, this charming design is ideal for a vacation home or weekend getaway at the lake. Use the garage to store your jet skis, canoes, kayaks and bikes and invite friends to spend the weekend with you at the lake. With the second bedroom there is enough room for you and your guests (or your kids) to gather and sleep comfortably. Accommodating and flexible in design, it is easy to see that these carriage house plans can satisfy a variety of needs. Just use your imagination, and you’ll realize that one of these plans no longer needs to be overlooked, but rather it is just right for you! Everyone enjoys packing up for a weekend getaway and heading out into the country woods from time to time. However, when the task of packing becomes so daunting that it can persuade you into abandoning your trip, this can become a problem. Fortunately, this problem has a solution. 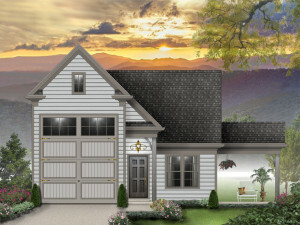 This featured carriage house plan serves as a perfect vacation or weekend home and is equipped to handle all your storage needs that can make packing for your weekend getaway such a challenging chore. With a three-car garage located on the lower level this plan provides ample space for canoes, kayaks, ATVs, fishing equipment, and all your gear for enjoying the great outdoors. It also offers a place to kick off the boots and relax after a long day of hiking or paddling around the lake with two bedrooms, as well as, a family room and dining room to bring the family back together after everyone has had a little rest. For those looking to mix a little bit of work with their play, the upper level features a cupola, which can function as a private study, perfect for those looking to get a couple hours of work done during their break. Or, it can serve as a perfect backdrop for enjoying your morning cup of coffee or tea while being at peace with the surrounding woods. Even with all of its functionality, this vacation house plan is able to seamlessly blend with the natural environment as it’s rustic and woodsy exterior allows it to appear as if part of the natural landscape. 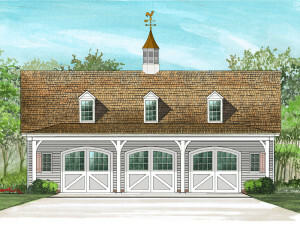 To view additional carriage house plans please browse our entire collection. 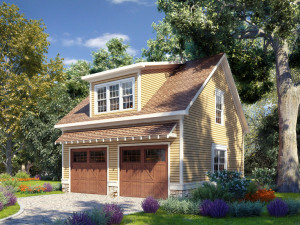 For many planning to build a garage, there is a growing trend with carriage house plans. These compact floor plans contribute additional functionality to the ordinary garage plan in that they offer a fully functional living area in conjunction with the garage. The finished living quarters can either be on the same floor as the garage or positioned above the garage creating an upper level. Carriage house plans cover a broad range when the living area is considered starting with a studio apartment and stretching to a two or three bedroom design. 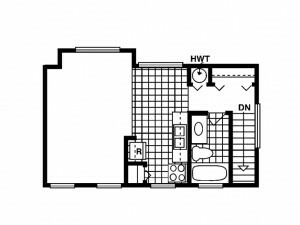 These floor plans include at least one full bath and a modest kitchen in most cases. Some designs include thoughtful extras such as an eating bar, walk-in closet or a laundry closet. So, why are carriage house plans becoming a popular choice when it comes to building a new garage? The list below addresses some of the reasons why buyers and builder make them their top choice. Added Value – Now only does a carriage house contribute street appeal and functionality to your existing home, but they also add value to your residence. Furthermore, it is easy to find a design to complement your home while adding usable space. 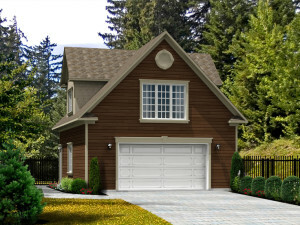 Extra Income – Many home owners build a garage for additional parking and storage space. If you’re going through the trouble to build the garage, you might as well make money too. Home owners are opting to use garage space for personal needs while renting out the living quarters for additional income. Carriage house plans with a private entrance or exterior stairs leading to the living quarters are especially popular for this possibility. In-Law or Guest Suite – Everyone enjoys out-of-town guests, overnight visitors and short visits from friends and family members. Your kids may especially like long weekend visits from Grandma and Grandpa. 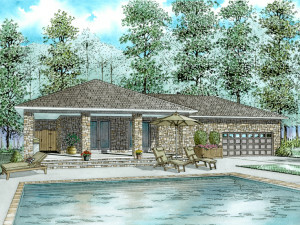 With a carriage house plan, your guests will have the privacy and comfort of home while staying with you. Home Office – For those who run a home-based business, a carriage house is the ideal solution to office needs. The living area can easily serve as an office or meeting room providing a space to work or meet with clients without disturbing the main home. Furthermore, if offers peace and quiet, essential for productivity without ever leaving home. Flexible Space – Sometimes, as families grow and change, they need a flexible space to change with the many phases of their lives. A carriage house design with an open floor plan allows for this flexibility. Perhaps it can serve as a play area when the kids are small and transform into a recreation room or home theater when they are teenagers providing a place for them to hang out with friends. When they’ve grown and moved away, convert the space into an activity room or meeting area where you can meet with your gardening club or play cards with your friends. The kitchenette and bathroom will be handy no matter what the phase of life. Work Space – Hobby enthusiasts often benefit from carriage house plans. The living quarters are perfect for use as a hobby room, craft area, etc. Use the living area as a workspace for all your projects. The plus side to this option is that you won’t have to clear the dining room table before every meal. And if that’s not enough, the bedroom and bath will still be available for overnight visitors in most cases. Secondary Residence/Weekend Retreat – For the people who like to get away from it all, carriage house plans are an economical and practical solution. They are a great alternative to vacation house plans. Whether built on a wooded lot or a in a cozy neighborhood, carriage house plans deliver storage and comfortable living. Use the garage to store your outdoor sporting essentials from a boat or ATV to bikes or hunting gear. The living quarters will provide a comfortable place to kick back and relax after a day of fun on the lake, hiking or exploring town. Some carriage house plans are designed with multiple bedrooms offering room to bring friends, family or the kids along for the weekend. If you are considering building a new garage, take time to think about the additional value and possibilities of choosing a carriage house plan. For many, living in a limited space is tough, but most make do with the space they have. However, one-room living is the trickiest of all, and city dwellers, students and seniors face this challenge more often than anyone else. If you are considering a carriage house plan or studio apartment design from The House Plan Shop for a vacation home, rental property, guest suite or hunting retreat, these tips will help you make the most of your one-room living space. Determine how you will use this living space and how you want it to function. Will it be used for everyday living or weekend getaways? Will more than one person live here at a time? Will you need a space for entertaining? Will you need a space for working? Decide what items you will absolutely need in the studio apartment. Consider furniture pieces such as a bed, desk and sofa, as well as appliances and electronics like a computer, TV and microwave. Devise a plan to divide the room into public and private spaces. Depending on how you plan to use the space will determine how much public and private space you will need. Try separating the common areas from the private space using a bookshelf or folding screen as a room divider. Now consider the common space. Can part of the common space serve two purposes? Can the sitting/entertaining area serve as a dining space too? Create zones within the common space. The way you decorate and furnish the room can help designate each area within the common space. A nice light fixture above an area rug can define the entertaining space while a desk and bookshelf combination can designate an office or study area. From this point, the rest is all in the way you arrange, furnish and organize your one-room living space. These pointers will help you finish your space with style, comfort and function. Choose multi-functional furniture pieces such as a bench for seating with storage inside or a sleeper sofa for overnight guests. Choose furniture on legs. Being able to see under each piece makes a room feel more open and spacious. Consider space saving furniture pieces and accessories such as a flat screen TV that hangs on a wall or a small desk instead of a large bulky one. Invest in a few big pieces of furniture. Too many small ones make a room feel cluttered. Plan for company. Purchase a few movable seating pieces such as stools or an ottoman that can be moved near the sofa for conversation. And if a sleeper sofa is not in your budget, try an inflatable air mattress. Select storage pieces that fit your lifestyle. Open storage only works if you’re neat and tidy person. Otherwise conceal small items in decorative bins, baskets and boxes and stack them under desks and end tables. For extra storage, go vertical. Bookshelves and wall mounted cubes are essential. Let the amount of space you have dictate how many belongings you own. Keep a tight color palette. Decorate with one color and incorporate different textures through flooring, window treatments, furniture pieces and accents to achieve cohesion.